In a ruling that can be considered both as a win and a loss for Samsung, a UK judge has decided in favor of the Korean manufacturer in an intellectual property case. The judge said that the Galaxy Tab was not “cool” enough to be confused with the iPad. 1) The view from the front is really very striking. 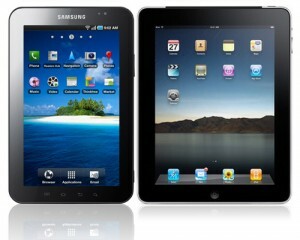 The Galaxy tablets are not identical to the Apple design but they are very, very similar in this respect. The Samsung tablets use the very same screen, with a flat glass plate out to a very thin rim and a plain border under the glass. 2) Also neither Apple nor Samsung have indicator lights or buttons on the front surface or obvious switches or fittings on the other surfaces. There are some subtle buttons on the edges of the Galaxy tablets but they do not contribute to the overall impression. There is an overall simplicity about the Samsung devices albeit not as extreme as the simplicity of the Apple design. 3) The thinness enhancing effect of the sides creates the same impression. 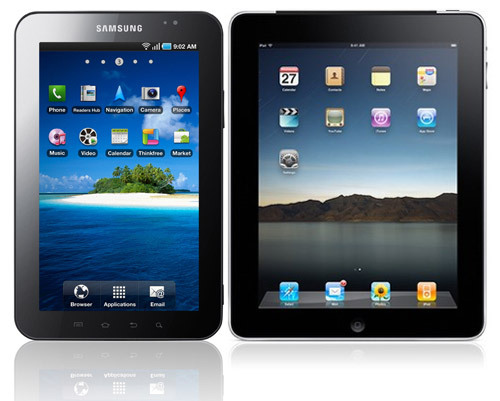 It causes both the Apple design and the Galaxy tablets to appear to float above the surface on which they rest. However the details of the side edges are not the same. The Apple design has a pronounced flat side face which the informed user would see clearly (and feel). It is absent from the Samsung tablets. I think Apple can potentially spin this into a win and create whole new marketing campaign based on this. “The iPad. We’re legally cooler than the competition.” What do you guys think?